This image is a detail from an installation "what do you dream about at night" featured at Artprize. Though I didn't have time to look at each individual jar, I love the concept. 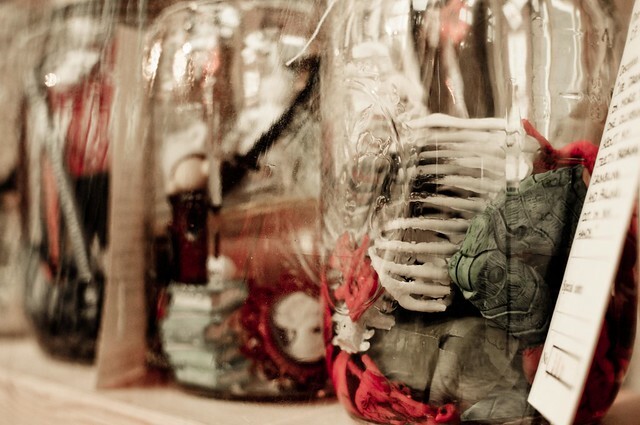 Dreams in jars. I feel like I have been living in my dreams the past few weeks. In dreams anything is possible, I love that aspect of dreams. One third of a day can go absolutely any way your mind thinks it should go. It is not always good, but most of the time it is wonderful and beautiful. The absolute beauty is that it belongs to only you. i love the concept as well. a whole new way of collecting dreams. simple. fantastic. Makes me think differently about people to imagine them as walking dream jars. such a cool concept. I've been having crazy dreams that are so tied to reality I can't remember what's real and what's not when I wake up. maybe I should put them in a jar.